Showgirls, Swing & Success for Peaky Blinders Takeover! With rave reviews and sell out shows, it’s fair to say that the Peaky Blinders Takeover nights have well and truly hit the midlands with a bang. Recent events at Leicester’s Mercure Grand Hotel and Nottingham’s Saltbox saw revellers don their best three-piece suits, flat caps and flapper dresses for a night of 1920s tomfoolery. Nottingham’s Saltbox event even saw original Peaky Blinders gang members Fred Farr & Lovelock from the hit BBC TV show host the event with the amazing Talulah Blue adding a hint of hedonism with some beautiful burlesque and the seven-piece brass busting Kingbrasstards giving the crowd a high tempo set full of swing. 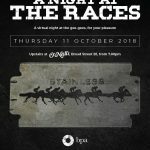 If you’ve not experienced a Peaky Blinder night yet then fear not as you can catch the next takeover on August 18th at the Mercure Grand Hotel Leicester with the highlight show of the summer – The Shelby Summer Ball in partnership with Sadlers Brewery who will be serving a full range of Peaky spirits and Peaky Blinder IPA and Pale Ale. Featuring none other than Johnny Dogs (Peaky Blinders) doing an exclusive DJ set, guests will be treated to a night of dinner, dancing, burlesque, brass bands, swing and showgirls along with a full casino to make sure the night’s a total blinder!